July was a trying month for us on Wickedfood Earth Farm, our main borehole ran dry, and our website was hacked. From a water perspective, we were able to open up our old borehole and renovate the windmill, so are once again irrigating our garlic, and are now using wind-power. Hoping for a bumper crop this season. We were able to retrieve most of the information on the website, but lost most of the design elements, so are frantically building a new site. For the Venison Tasting Menu lunch, the Wickedfood Earth Country Cooking School will once again showcase how flavourful antibiotic and growth hormone-free veld-raised meat is. This will be a 20-dish, 4-course menu, showcasing the best of venison from different animals, taking traditional South African recipes and giving them a facelift, from our popular air dried carpaccio, venison pâté and salami, to succulent wood roasted leg of venison, and pan fried pancetta wrapped loin, served with farm grown winter vegetables, and of course, a hearty winter pudding. We will also be offering a farm tour and discussion about ethically raised and harvested venison and secrets on how we at Wickedfood Earth Country Cooking School get the best out of cooking with venison. For the Mezze country lunch on 19 August we’re using the very best local grown, seasonal produce. Our country cooking school team, will build a mezze menu around these ingredients. These lunches are in the form of a selection of ±20 generous mezze dishes to share, including freshly baked farm bread, award winning artisan cured meats and pâtés, farm made pickles and dips, a hot meat dish, with side seasonal vegetables, and a hot dessert. For a product list click here…. 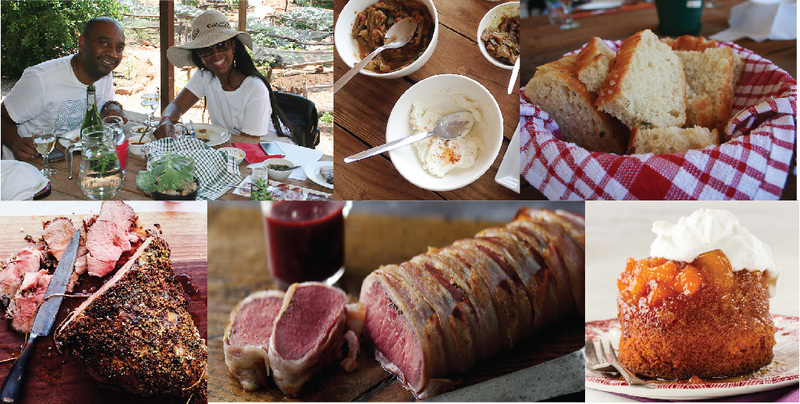 In recognition of our Venison lunch, here are a few great winter venison recipes – click here ….. If you’re planning a team building cooking class, event, corporate function, product launch, kitchen tea, milestone birthday, please consider Wickedfood Earth Country Cooking School. We work together with our clients to develop specialised events to suit both the occasion and their budgets. (Click here to read about past functions). It is through these events that we raise funds for the on-going research and our education programmes. For more information click here …. Mike, Cilla and the Wickedfood Earth Country Cooking School Team.